Roll up that special joint and package it securely for transport with the new RAW Aluminum Storage Tube. Sized perfectly for your King Size smoke and kept safe just like a fancy cigar. Cork line top to keep it fresh. 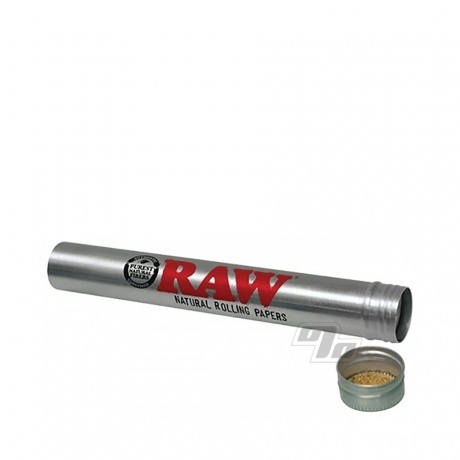 Brought to you by RAW Rolling Papers but works with any king size size rolling paper or cone. This pocket-able metal tube with securely fitting twist on lid is a classy storage option. Tired of squishing my rolls in my pocket before a concert or show. This solves the issue. Reasonable price for something functionally worthy! Keeps things from getting crushed! Love it! puts out any j immediately, i bought 3 for my friends and i ! love it so much, it’s smell proof as well.